It is with sadness that the family of Donalda McLeod (nee McLaren) of Cochrane, AB, announce her passing on Saturday, November 25, 2017 at the age of 78 years. Donalda was born in Calgary on May 17, 1939, the eldest daughter of Donnie and Leona McLaren. She spent her youth in the farming community around Dogpound, AB and in Field, BC. 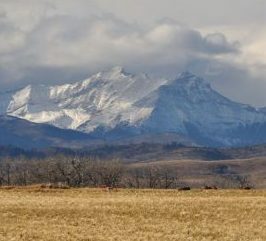 In the early fifties, the family moved to Calgary where she completed her formal education at Western Canada High School. Donalda worked for many years with the City of Calgary and with the Society of Management Accounts as secretary to the executive director of Alberta until her retirement. Donalda married Robert (Bob) Thomas McLeod on July 11, 1959 in Calgary. Their son, Donald (Don) Robert was born on April 7, 1961 and the family remained in Calgary until 1980 at which time they moved to Cochrane. Donalda spent many years walking fields looking for relics as it was a passion of Bob’s and soon became hers. She also loved ‘anything’ royal and followed the Royal Family with great interest. The family enjoyed camping as well, and their favorite sites were usually in the mountains. Her love for that area was developed early on, living in Field, and remained her and Don’s vacation destination for many years. Donalda leaves to mourn, her dear son, Donald (Don) McLeod of Cochrane, AB and her sisters, Rheta McLaren of Calgary, AB and Marilyn (Rob) Andison of Red Deer, AB. She also leaves behind her nephews, Brad (Patty) Risler of Stettler and Greg (Alisia) Risler of Stetller; two grandnephews, three grandnieces and one great grandnephew. Donalda was predeceased by her parents Donnie and Leona McLaren and her husband, Bob. Grateful thanks to Dr. Fundytus, Doctors and staff at the Foothills Hospital and Sarcee Hospice for their care and compassion. A Private Graveside Service will be held. Condolences may be left at www.cochranecountryfuneralhome.com. Cochrane Country Funeral Home 403-932-1039. Donny, I was very saddened to hear from Bev that your dear Mom, Donalda has passed away. She was your greatest friend. At one time we saw each other a lot as neighbors and unfortunately you moved away to beautiful Cochrane as you all loved the outdoors and we lost touch. We reminisce often of watching you kids grow up together and all send our deepest condolences to you and the McLaren family. I hope we may get-to-gether for a neighbor hug and visit and you can come in or I will come out there(maybe meet at the Legion) as I was recently there. Keep well and please contact me.